In something as complex as digital marketing, errors will happen. There are a lot of moving parts, a lot of communication avenues. On occasion we overlook something. Despite all the technology we use, Marketing 360® does employ human talent. We work hard at execution excellence, but that doesn’t mean we’re perfect. Other times, the client miscommunicates to us. It’s not easy for people who are marketing novices to communicate details about their business, so errors can happen. Most of the time, these errors are minor and happen early in the marketing process. Sometimes they’re bumps in the road that can be concerning for clients. From the beginning, our marketing consultants set realistic expectations with regard to the marketing process. We explain that it takes time to dial things in and that early on, an incorrect assumption can be a win because we get valuable data that tells us something isn’t effective. And at Marketing 360®, we don’t make mistakes. When an error occurs, we correct it. It’s important for clients to realize this is part of the process and work with us through it. But some people react strongly when errors occur, and they risk making a serious mistake, which is to drop out of their marketing campaign altogether. 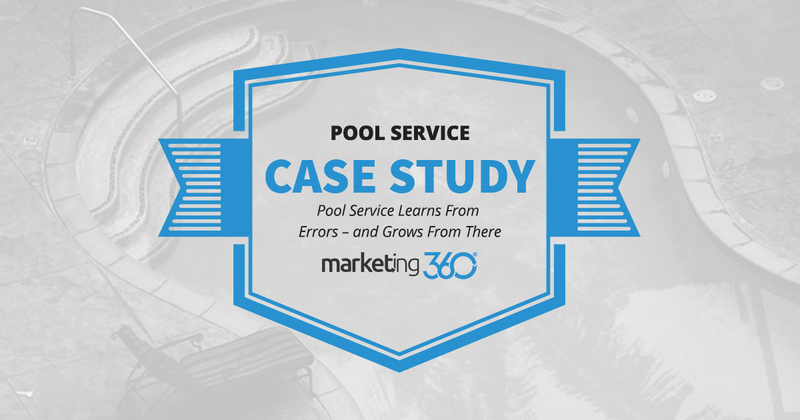 Here’s how this almost happened with a pool service marketing client we work with, and why the owner is now so relieved he didn’t turn an error into a costly mistake. We started marketing for this client in January of 2018 and got off to a hot start. Conversion data looked impressive. Then, in late March, the client related to us that many of the leads he was getting were coming from south Orlando, which was outside his service area. Using our CRM software, we determined that he’d told us target Orlando and had not specified that the southern area was outside his service area. The client owned up to the error, agreeing that he’d failed to communicate that detail to us. Nevertheless, he’d incurred a hit to his budget. Then, when we made the necessary targeting adjustments, the overall conversion data slumped. As is often the case, the business owner reacted emotionally when the leads dropped. To paraphrase, he implied that he’d quit marketing with us as soon as possible, and felt – at the moment – like he’d prefer to “burn my money in my BBQ” that give more to us. The marketing exec calmed him down, assuring him things would improve. At this point, we were three months into the initial six-month contract, so the business was obliged to stick things out. We did an audit of his ads and SEO strategy and made a number of adjustments. One advantage to this “error” is that we collected some relevant traffic data, so we were able to determine what ad copy was generating the most interest. As you can see from the graph, in June things started to pick up, and going into August his conversion numbers are better than ever. Needless to say, he didn’t quit. In fact, we’re into month 8 and going strong. Better yet, he gave us a great referral and we’re marketing for that business now. One of the biggest mistakes we see in small business marketing is the business owner who loses patience every time an error occurs with their marketing. They jump from vendor to vendor because they can never find someone who’s perfect. And they never will. But constantly resetting their marketing searching for flawless execution is, often, a fatal mistake. Give us six months. We won’t be perfect, but we’ll recognize and correct errors as fast as possible. After six months, we’ll get things dialed in. Perfection is never possible, but solid marketing ROI is – without a doubt. With the right expectations and process, we’ll help you achieve that important goal.